As part of my effort to read more scifi in translation, I jumped at the chance to check out Nest of Worlds, Huberath’s first novel to appear in English. A major force in Polish science fiction, Huberath is also a professor of biophysics and biological physics at Jagiellonian University in Krakow. And he brings everything to this metafictional tale of life, death, and reading. We first meet Gavein Throzz while he’s travelling to his new Land, a journey that everyone on his world must make every thirty-five years. Only four Lands exist. Each person is also placed into a hierarchy according to his or her hair color (“black,” “white,” “gray,” and “red”), and everyone has two names (the one they use everyday, and the one that foretells the manner of their death). Once Gavein and his wife, Ra Mahleiné, have been reunited in their new land of Davabel (having been forced to take separate journeys according to their separate castes), they try to live a normal life in their boarding house with the other residents — until people start dying. First, the deaths seem random, but eventually people figure out that everyone who comes in contact with Gavein dies within a couple of days. Eventually, the bodies pile up until it’s impossible for Gavein to shrug off the bizarre assertion, and whenever someone tries to kill him, that person dies instead. The scientific institute that attempts to study him and then kill him is wrecked by an earthquake, and then heavily bombed, but of course Gavein escapes alive. Meanwhile, some of his friends have been reading a book called Nest of Worlds (those friends have also died). Out of interest, Gavein picks it up and finds that it is none other than a book about people reading a book called Nest of Worlds (do you have a headache yet?). At this point, we as readers plunge into the nested stories with Gavein, burrowing further and further until it’s almost impossible to remember how many worlds removed we are from the primary story (Gavein’s world). In each nested world, characters read Nest of Worlds, but the further the world gets from Gavein’s, the more numerous the Lands and the shorter the time spent in them. As one former reader wrote in notes he left in the book (which Gavein finds), the worlds can be understood by deriving complex formulas and locating intricate patterns. So if it’s true, as Gavein and the note-taker realize, that each nested story contains more Lands and a smaller number of years in which to reside in each Land, that suggests that their own world may just be nested within yet a higher world (i.e. our world), which would be nested in yet another world (God?). But what do all of these nested worlds and epidemic of deaths have to do with the act of reading? Huberath asks us to consider what happens to the characters we read about once we’ve put a book down. For instance, if a character has just fallen off of a cliff and we put the book down to take a bath or run an errand, what happens to that character? Do they remain in a kind of stasis? How could it be otherwise, since we won’t know what happened until we pick up the book again? Nest of Worlds asks us to consider not our own consciousness chewing on the people and events in a narrative, but the existences of the characters themselves. Eventually, Gavein becomes aware that he is likely a character in a story being read by someone on another plane of existence. The deaths that have occurred were the result of characters who were only to have small parts in his narrative. Each time they weren’t needed any longer to further the Gavein story, they were “killed off”. At least, that’s my interpretation of the deaths, but I’m sure there are many others. 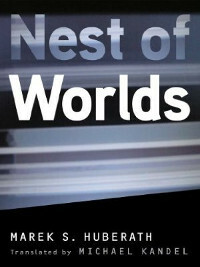 In a way, Nest of Worlds is reminiscent of the Star Trek: TNG episode “Ship in a Bottle,” in which the holodeck Moriarty becomes self-aware and demands to leave his fictional world to explore the “real” world. At the end of the episode, Picard, Riker, and others wonder if they/we are ourselves living in a holodeck world, manipulated and observed by a species on another plane of existence. The very structure of Nest of Worlds proves Huberath’s point, since the further we move away from a world, the less we remember about its characters, since our brains can only hold a certain amount of information at one time. And it’s not surprising at all that when you pick up the novel after a break, and find yourself in any of the nested worlds, the result is disorienting, to say the least.